Andrew Whitlock has been advancing new technologies in his work to improve sustainable farming practices. As Director of Precision Agriculture, Andrew has welcomed the early roll out of the National Broadband Network (NBN). He advises it will enhance his work in agriculture, allowing his company and his clients increased reach and opportunities. 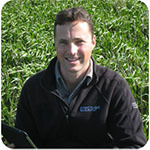 With a degree in Agricultural Science (Hons), Andrew began his working career with the Department of Primary Industries Victoria as a state-wide Agronomist in 2002. In the past 10 years he has assisted with the implementation of sustainable farming practices through the integration of emerging technologies and agronomy. Now in business, his company - Precision Agriculture - specialises in using technology to advance agronomy- using applications including spatial data management, satellite imagery, CTF/No-till, consulting and on-farm implementation. Andrew advises the NBN will assist him fully embrace these applications through the increased reliability and wider connectivity of–high speed internet. Andrew’s passion for sustainable Australian agriculture, and commitment to developing precision agriculture, was recognised by the Australian Society of Agronomy inaugural Young Agronomist of the Year (2006). His business success is testament to the use of digital enterprise. It is this passion and commitment to the industry, and his understanding and application of new technologies that makes Andrew a Central Highlands Digital Enterprise champion within the Agricultural Sector.